THE LIBRARY ARCHIVE-FROM THE VAULTS OF CAVENDISH MUSIC. The names Sonoton, De Woife, Amphonic, Conroy and Cavendish Music roll off the tongue of aficionados of library music, which ranges from a small coterie of collectors to sample hungry hip hop producers to DJs and compilers like Mr Thing and Chris Read. The two BBE stalwarts were part of the chosen few who were invited into the inner sanctum that is Cavendish Music’s vast London vaults in 2014 when the pair were participating in WhoSampled’s Samplethon event.This was a competition where producers had to create new tracks using samples of tracks from the Cavendish vaults. There was a catch though, everyone was against the clock. This must have been hugely frustrating for Mr Thing and Chris Read who at last, had gained access to the Cavendish vaults, which is the largest independent library music publisher in Britain, and also represents many music catalogues from the four corners of the globe. However, with time at a premium, Mr Thing and Chris Read were unable to take time to discover all of the treasure and hidden gems that were hidden within the Cavendish vaults. However, whilst looking through a box of records and tapes, the pair discovered an eclectic selection of timeless library music that they felt deserved to be heard by a wider audience in its original form. Some of that music found its way onto The Library Archive-From The Vaults Of Cavendish Music, which is a two LP set that be released by BBE on the ‘10th’ of November 2017. 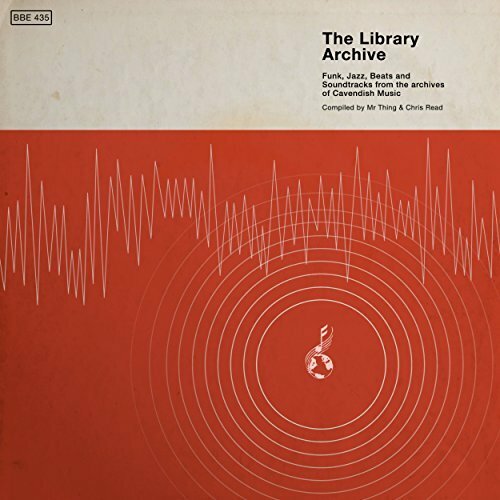 It’s a captivating and fascinating insight into the little known world of library music. The origins of Cavendish Music can be traced back to 1930, when two of Britain’s long-established and well-respected musical companies Boosey and Company and Hawkes and Son merged and became Boosey and Hawkes. By the time Leslie Boosey and Ralph Hawkes’ companies became one, the combined company manufactured brass, string and woodwind instruments and was well on the way to becoming the world largest classical musical publisher. Later, Boosey and Hawkes became the largest independent library music publisher in Britain, and represented many different music catalogues from around the world. That was still to come. For Boosey and Hawkes, and the other British library music companies, the birth of television in the mid-fifties was a game-changer. No longer was the classical music that had long been a staple of their business as popular among their clients. As a result, Boosey and Hawkes decided to diversify into library music publishing. By then, there was already a huge demand for music to provide the soundtrack to radio, television and film. Originally, library music was meant to be used by film studios or television and radio stations, and was never meant to be commercially available. The music was recorded on spec by music libraries who hired often young unknown composers, musicians and producers. This ranged from musicians who were known within publishing circles, to up-and-coming musicians who later, went onto greater things, and look back fondly at their time writing, recording and producing library music. This they now regard as part of their musical apprenticeship. For the musicians hired to record library music, their remit was to provide companies like Cavendish Music with a steady stream of new music, which was originality referred to as production music. During some sessions, the musicians’ remit was write and record music to match themes or moods. This wasn’t easy, but after a while they were able to this seamlessly. Soon, the musicians were able to enter the audio and write and record a piece of music that matched a theme or mood for a film or television show. Once the library music was recorded, record libraries like Boosey and Hawkes, which is now known as Cavendish Music, sent out demonstration copies of their music to production companies. If the production companies liked what they heard, they would license a track or several tracks from the music libraries. That was how it was meant to work. Often, the music recorded on spec by library companies was never licensed. Since then, many of the tracks have lain unheard in the vaults of music libraries like Cavendish Music. That was no surprise, because during the sixties and seventies, which was the golden age for library music, and indeed Cavendish Music, when a vast quantity of music was recorded in the hope that it would license the tracks and use them in films, television or radio. Sometimes that proved to be the case; especially during the sixties and seventies, when the music created by these groups of largely anonymous composers, musicians and producers provided the soundtrack to some of the biggest television programmes on British television, ranging from The Sweeney and The Professionals to cartoons like Dangermouse and current affairs to quiz shows. Many of these themes became part of the soundtrack to British life and are fondly remembered by a generation of adults. However, not everyone in Britain was a fan of library music. This included the Musician’s Union in Britain, who banned their members from working on recording sessions of library music. Somewhat shortsightedly, the Musician’s Union thought that eventually, there would come a time when there was no need for any further recordings of library music. Their fear was that the sheer quantity of back-catalogue would mean no new recordings would be made, and their members would be without work. Soon, the record libraries had worked out a way to circumvent the band, which suited all parties. Some record libraries would fly out composers, arrangers, musicians and producers to Holland and Belgium, where local musicians would join them for recording sessions. This meant that often, the same musicians would play on tracks for several composers. These were lucrative sessions for the musicians involved, who had the last laugh. Incredibly, it was only in the late seventies, that the stubborn dinosaurs that ran the Musician’s Union lifted their ban on new recordings of library music. By then, the golden age of library music was at an end, the Musician’s Union ban had cost their members dearly. Later, sample hungry hip hop producers who dug deep into the crates found albums of library music. This was the ‘inspiration’ that they were looking for, and many ‘borrowed’ samples from their newfound musical treasure. Soon, other producers, DJs and collectors went in search of these long-overlooked albums of library music. Since then, they’ve become increasingly collectable, with producers continuing to sample them, while DJs incorporating library music into their sets. There’s also a number of collectors who spend their time and money looking for, and buying albums of library music. Just like the producers and DJs, these collectors were aficionados of library music and are sure to enjoy the twenty-three tracks that feature on The Library Archive-From The Vaults Of Cavendish Music which is a lovingly compiled double album. The Library Archive-From The Vaults Of Cavendish Music features an eclectic section of music that was recorded by largely anonymous groups of musicians. They were given a variety of names by the staff at Cavendish Music, which ranged from Sound Studio Orchestra to The Cavendish Orchestra, The New Dance Orchestra and the groovy sounding Sound Studio Set. Other times, the musicians became The New Sounds or the exotic sounding The Latin American Orchestra who contribute Come Cuban! Sometimes, the musicians arrived at the studio to be told that they were going to become The New Concert Orchestra or The New Percussion Octet. It was like a real-life episode of Mr. Benn who was also a beneficiary of library music during his lifetime. These various groups feature on The Library Archive-From The Vaults Of Cavendish Music and seamlessly switch between themes, moods and genres. That is the case throughout The Library Archive-From The Vaults Of Cavendish Music, where this group of versatile and talented musicians create twenty-three tracks that the executives at Cavendish Music hoped would be used on films, television and radio. Certainly one can imagine the Sound Studio Orchestra’s recording of the Dennis Farnon compositions Southbound and Snowmobile finding their way onto the soundtrack to a British television show in 1974. Snowmobile sounds as if it belongs on an episode of The Sweeney, accompanying a rueful Jack Reagan as the blaggers get away. Trevor Duncan wrote Funkund which was recorded by The Cavendish Orchestra in 1975, and just like the John Scott 1979 composition Milky Way and Tony Kinsey’s Kaleidoscope from 1979 have a seventies cinematic sound that paints pictures and bring back memories of cop shops where car chases and punch-ups were the order of the day. These tracks are sure to bring back memories to people of a ‘certain’ age. The New Dance Orchestra recorded the Dennis Farnon composition The Trackers in 1972, a stirring, dramatic big band recording that sounds as if it’s been inspired by Lalo Schifrin’s film scores. Sound Studio Set recorded two of Pete Moore of compositions in 1974, Two Bars and The Scape Goat in 1974. They’re among the jazzy numbers on the compilation. One of the hidden gems on the compilation is the John Cacavas composition, The Big Score, which was recorded by The Cavendish Orchestra. They combine elements of jazz and funk to create a filmic instrumental that in 1973 should’ve provided the backdrop to a script that featured cops and conmen. Closing Side B is The Latin American Orchestra who recorded the Come Cuban! in 1971 which shows just how eclectic library music was. The five tracks on Side C were written by Dennis Farnon, who was a talented composer who could write music for all types of moods and situations. This ranges from The Rally which was recorded by the Sound Studio Orchestra in 1974, and would’ve been the perfect accompaniment to footage of souped-up Hillman Imps, Minis and Ford Escorts racing across the British countryside. So would Night Driver which was one three Dennis Farnon compositions recorded by The New Dance Orchestra in 1972. Just like Border Incident and Lady Killers, Night Driver would’ve been the perfect soundtrack to high-speed car chases in a television shows or films in 1972, as pre-PACE and non-PC PCs chased bad guys and dished out justice in their own Old Testament way. This they do to a soundtrack penned by Dennis Farnon and recorded by The New Dance Orchestra. The New Dance Orchestra return and open Side D with the first of their two versions of Sam Fonteyn’s One Long Trip. The Warm Version was recorded in 1971, while the Cool Version was recorded in 1973. Mr. Thing and Chris Read’s decision to include the two versions offers the opportunity to compare and contrast these two timeless tracks. It’s a similar case with the inclusion of the long and short versions of The New Concert Orchestra’s Night Shade which were recorded in 1973. This allows listeners two opportunities to reflect as they enjoy this beautiful, ruminative and rueful track. Another orchestrated track from 1973 was Smile Of A Stranger, which was recorded by The New Sounds. It also features some funky guitar which will appeal to sample hungry producers. They’ll enjoy the delights of The New Percussion Octet’s Graphic Pt. 2 which was recorded in 1972 and is a source of myriad of different percussion. It’s the final track on The Library Archive-From The Vaults Of Cavendish Music, which was compiled by DJs, compilers and BBE stalwarts Mr. Thing and Chris Read. They’ve dug deep into the Cavendish Music vaults for musical delights for delectation of record buyers everywhere and have discovered a myriad of hidden gems and struck musical gold on a number of occasions when compiling The Library Archive-From The Vaults Of Cavendish Music. Many of the tracks are a reminder of the type of music that provided the soundtrack to films and television and radio shows during the seventies. For those of a certain age, the music on The Library Archive-From The Vaults Of Cavendish Music is a reminder of the seventies, which was a golden age for library music and many would say, British television. That is why so many seventies’ television shows and films are being remade by new a generation of producers and directors with varying degrees of success. The music on The Library Archive-From The Vaults Of Cavendish Music would be perfect for the remakes of these television shows and films as they’re an authentic reminder of the seventies. The sixties and seventies was the golden age of library music, when companies like Sonoton, De Woife, Amphonic, Conroy and Cavendish Music commissioned a vast amount of music which fifty years later, has found an appreciative audience that includes DJs, sample hungry producers and record collectors. Especially the music recorded and released by Cavendish Music, which was is the largest independent library music publisher in Britain. Very few people outside of the environs of Cavendish Music have gained access to the company’s vaults until relatively recently. Then in 2014, compilers and DJs Mr Thing and Chris Read, two BBE stalwarts, were among the chosen few who have been invited into the inner sanctum that is Cavendish Music’s vast London vaults. That was when discovered the music that features on The Library Archive-From The Vaults Of Cavendish Music, which is a two LP set that will be released by BBE on the ‘10th’ of November 2017. The Library Archive-From The Vaults Of Cavendish Music is, without doubt, the best album of library music that has been released during the last few years, and features a myriad of musical treasure and hidden gems aplenty. ← ANDREAS SPECHTI-THINKING ABOUT TOMORROW, AND HOW TO BUILD IT.